It seems that South Koreans have figured out what trains our brains and gives us (according to them) an intellectual edge: engaging in Talmud Study. Close to fifty million Koreans have studied the Talmud, and in a country where most people are Christian or Buddhist, that is a persuasive number. 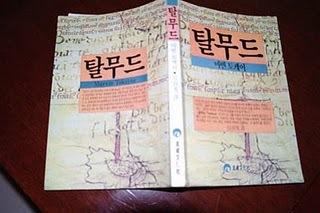 It is interesting to note that most homes have a copy of the Talmud in Korean (picture courtesy of the Embassy of South Korea). I wonder how Talmud is being taught there and how it’s being presented to young learners. Perhaps we could learn a few tips from them and interest teenagers in furthering their Jewish education. The next time your teen asks you why Jewish education is important, you might just have an interesting answer. This entry was posted on Tuesday, March 29th, 2011 at 2:00 AM	and tagged with Jewish education, Jewish parents, Jewish teenagers and posted in Jewish Education, Jewish Teens, Judaism, Parenting. You can follow any responses to this entry through the RSS 2.0 feed. I love the articles you’ve been posting. Do you have hard copies by any chance? I always wait until Shabbat to catch up on reading! Thanks! Thank you. Your comment came at the right time, just when I was feeling a bit down about these postings. Since I write directly into wordpress I don’t have copies.